We are a three generation family owned and operated business, taking pride in the work we do and the personal customer attention we provide. Everyday, since 1942! At Edmunds Ace Hardware, we work with our customers to help you find the right solution to your project. Whether it be painting, repairing a faucet , seeding a lawn or purchasing a new grill, the staff at Edmunds Ace Hardware will take the time you need to answer all your questions. We will also research and place special orders to get you those hard to find items! No need to drive all the way to the Big Box stores – Edmunds Ace Hardware has everything you need, here in town! Elizabeth Henderson has been with the Henniker team for 3 years. She manages the pet department, ropes, bath accessories and wall hangers. Her favorite part of her job is working with our customers. Harlan Hadley has been with the Henniker team for 35 years. He is the Store Manager and is responsible for the plumbing department. His favorite part of the job is helping people. 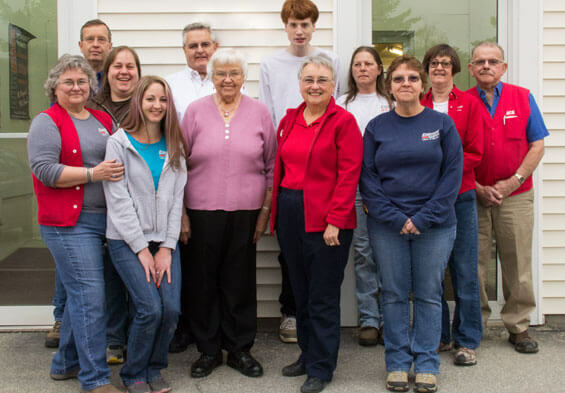 Betty Meade has been with the Henniker team for 39 years. She manages the housewares, stationery, cleaning, vacuum bag, appliance and toy departments. Her favorite part of the job is the people. Pat Harding has been with the Henniker team for 20 years. She manages part of the plumbing as well as the tools, door knobs, locks and accessories. She also orders the furnace filters and is one of our Webber Grill experts. Her favorite part of the job is working with the customers. Terry Richard has been with the Henniker team for 19 years. She is responsible for the lawn and garden department, weatherstripping, hardware and seasonal. Her favorite part of the job is learning something new every day. Sarah Schneider has been with the Henniker team for 10 years. Sarah manages the painting accessories, automotive department, flashlights and batteries and our nuts and bolts. She is also one of our Webber Grill experts. Her favorite part of her job is the variety of each day and always learning new things. She also enjoys building the Webber grills. Hattie (Parker) Edmunds opened Edmunds in 1942 with her husband, Clarence Edmunds. Edmunds served it’s customers by offering a large variety of items from hardware, plumbing, electrical and paint, to house wares, stationary, gifts, jewelry and glassware. Twenty years later, in 1962, when their son Richard was 18, Hattie and Clarence opened a second Edmunds location in Antrim. Doug Somers did 6 years of community service at the Antrim store before becoming part of the team 8 years ago. He manages the automotive aisle and the lawn and garden section. His favorite part of the job is gaining knowledge in the many areas that he helps customers with and working with customers.